I was a bit concerned when I made this as my husband hates batter or anything fried in breadcrumbs. In actual fact, this was nothing like a batter. The rice flour merely coats the fish to hold it together when you are frying it and the outcome is absolutely delicious. It is an incredibly easy dish to prepare, you just need to remember to start early enough so you have time to marinade the fish before cooking. The recipe uses rice flour. Rice flour is a form of flour made from finely milled rice. It is a particularly good substitute for wheat flour, which causes irritation in the digestive systems of those who are gluten-intolerant. Rice flour is also used as a thickening agent in recipes that are refrigerated or frozen since it inhibits liquid separation. Having spent a lot of time in abroad I realise that not all ingredients are readily available everywhere. If you can’t get rice flour try substituting corn flour, I’m sure you will get a similar result. As with all Stir-fry recipes it pays to prepare all your ingredients before you start cooking to ensure the textures are correct and ingredients are not overcooked. I found the recipe in an Olive cookery magazine but it is not available on their website so I have written it out below. Remove any stray bones from the fish and cut into 2 inch pieces. Put in a shallow dish and pour over the soy sauce. Marinate for 30 minutes. Remove the fish from the dish and reserve the soy sauce. Dust lightly with the rice flour. Whisk the fish sauce, sugar, shrimp paste, lime juice and reserved soy sauce together until the sugar has dissolved. Heat 6 tbsp of the oil in a wok over a medium heat. When hot, add the fish in batches and fry for 2 -3 minutes per batch, turning so they become crisp and golden on all sides. Remove and drain on kitchen paper. Discard the oil and wipe the pan. Return to the heat and add the remaining 2 tbsp of oil. Add the ginger, garlic and chilli and fry for 1 minute until fragrant. Be careful not to burn! Add the mange tout and spring onions, stir well then add the sauce and a splash of water to make a thick sauce. Simmer for 1 minute then stir in the fish pieces carefully so as not to break up and warm through over a low heat for 2 -3 minutes. In the meantime, cook the noodles as per packet instructions. 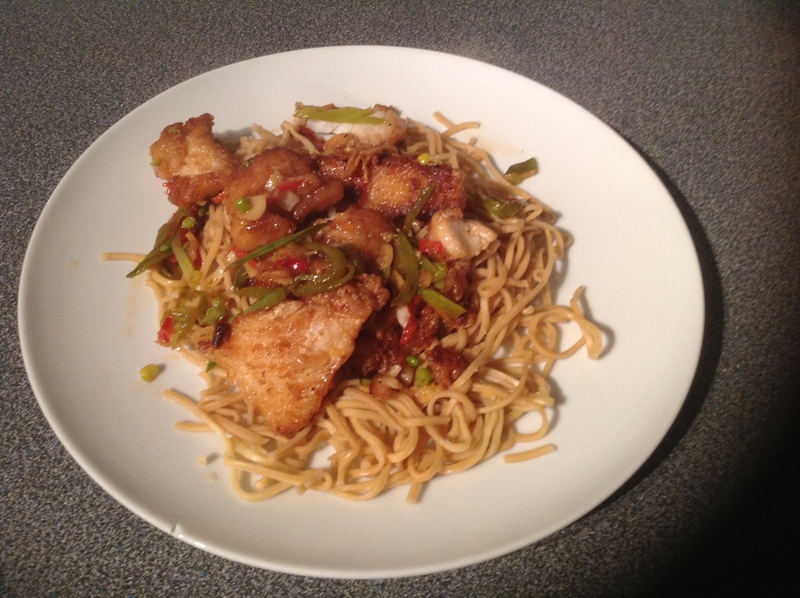 Drain well and serve, topped with the fish stir-fry.